6th July was a glorious day; we were invited to the US Naval War College for lunch on the terrace at the Officers Club and a tour of the museum by Capt Tim – we met Tim and his lovely wife Nicki with their two boys on 4th July. We shared stories of travel and living in foreign countries and became instant friends. A graduation was taking place that afternoon so the place was buzzing with brand new officers from all over the world in gleaming white uniforms – it was like being on the set of Top Gun. The college is the oldest war college in the world and is very proud of it’s history and academic performance, which focuses not just strategic warfare but prevention of war and statesmanship. The museum took us through the history of the college; which dates back to 1884, Naval activities in the bay area and the history of naval warfare. The torpedo displays were amazing, and e were interested to learn that controlled testing off Fremantle in 1942 was able to identify a defect in the primary Torpedoes used in world war II – 17000 were then used in the war and they remained in the US Navy tool box for nearly 40 years. Having sailed through the torpedo testing area on the way into Newport, they obviously continue to test these weapons at home too! 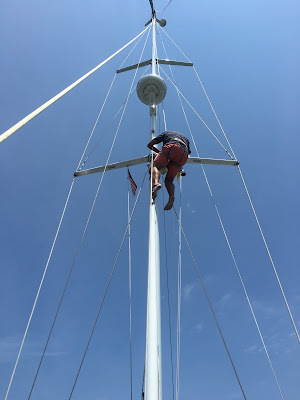 It poured down the next day and we were glad to be tucked up on a mooring behind Goat Island, we did a few boat jobs and then had to go ashore to collect our new Wifi Antenna from Oyster, as the rain cleared a bit we took the chance to explore Newport Shipyard. This is not a shipyard like I have ever seen before (and yes I have seen a few) – the marina and yard was packed full of the worlds most beautiful sailing yachts, including most of the J Class yachts. There was gleaming varnish and crew polishing and cleaning everywhere. We enjoyed a final day in Newport, did some provisioning and had a great seafood dinner with Jonathan and Gabbie on Aqualuna. Then we set sail for Martha’s Vineyard early on Sunday morning. It was really exciting to see the harbour entrance that was shrouded in fog when we arrived and then we were treated to a display of unique kites as we sailed up the coast. 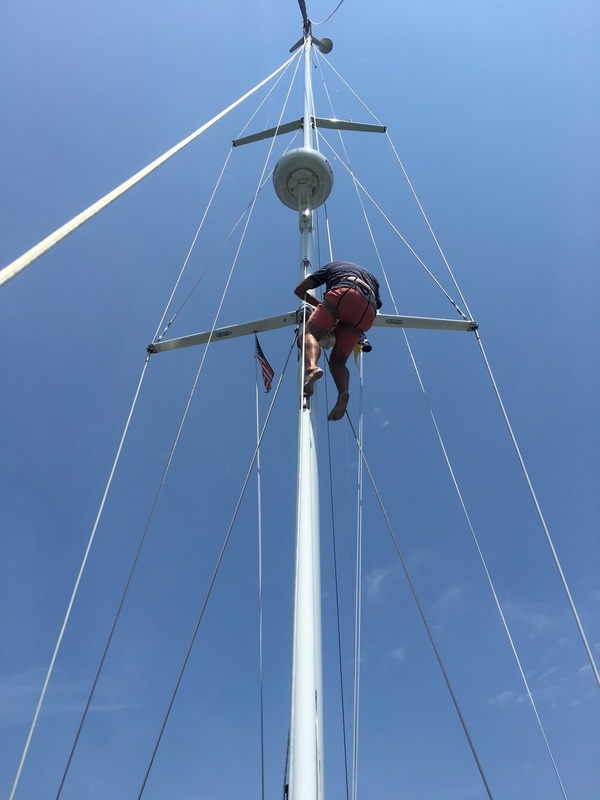 The trip was actually more of a motor sail as we needed to pass through the stretch of water called Vineyard Sound by 2pm when the current would turn against us, this managing tides thing is weird after so many months without them but shooting along at over 8 knots is nice. Along the way there was a race and a beautiful old classic yacht was dismasted with 20 people on board – the Coast Guard was very impressive and on the scene within about 15 minutes, together with the various towing organisations that operate in these waters. We later saw the Sophie being towed into Vineyard Haven. We had expected Martha’s Vineyard to be really busy so when we arrived to find only two boats at anchor we were pleasantly surprised and got a great spot fairly close to the yacht club. I called the yacht club to see if they would welcome us – when they said they didn’t have a bar I thought it was probably just a small club – we later found out that Vineyard Haven is generally a dry town – although the Black Dog Tavern is one of a few exceptions. We saw the Black Dog boats sailing in the bay, went ashore to find many shops selling blackdog merchandising and learned this was the first pub in town established by a retired Navy Captain in 1971 who had a black dog who he used to sail with, now a brand in it’s own right on the island. Aqualuna joined us a bit later and brought Lobsters along with them – another fabulous night of laughs. 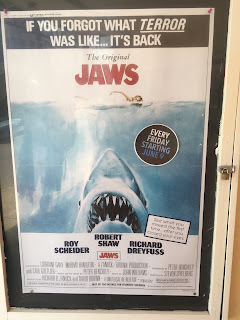 Next day we explored town and found some fun shops and learned that this was where Jaws was filmed – the local cinema was running it every Friday through summer! 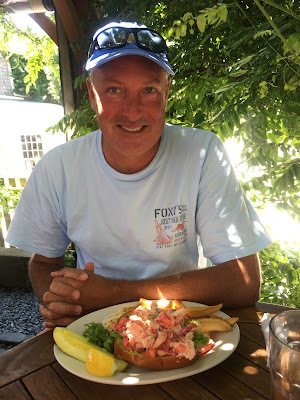 We spent two nights in the Haven and then moved around to Edgartown where we took a mooring right in the river which looked to me a lot like Beaulieu in the UK, with beautiful houses with manicured gardens leading down to the waters edge to the dock with a boat tied on it. This is a great place with a really lively, touristy town, a welcoming yacht club and lots of great seafood restaurants. We had our final dinner with Aqualuna in the yacht club before they headed off south to layup the boat in Annapolis, and took a cycle trip to the near by town of Oak Bluffs. Oak Bluffs is famous for being a Methodist camp ground that then developed these really cute ‘Gingerbread Cottages’ all around a central tabernacle, it also has the oldest merry-go-round in America. We opted to leave town before the community sing later that night! 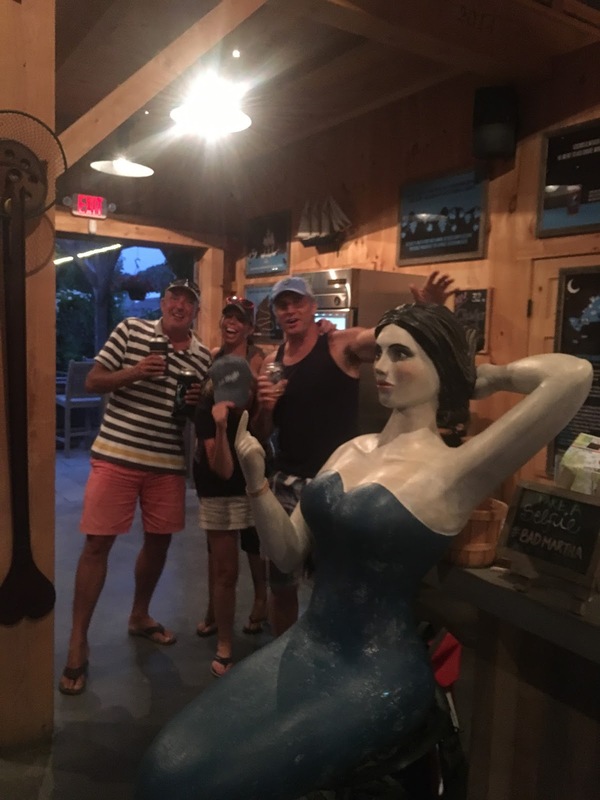 On the way back we called into a local brew pub - Bad Martha’s before long we had made some new friends, we all shared a few different beers and had a fun evening with Mac the dog too – Andrew was giving a new t-shirt by Josh to remember our time in MV. We had mixed weather while in Martha’s with a strong cold front coming through – nice to be tucked up again. It was amazing as we had been doing laundry on the boat and within minutes the temperature just dropped dramatically before big clouds arrived and then strong winds and rain. All the big yachts anchored outside were allowed into the harbour to anchor where the ground is usually protected – I am not sure if the harbour master invited them but it was good to see. We had a great morning out exploring Katama Bay and the wild South Shore Beach with a picnic until sandflies drove us back to the dinghy. We had a lovely chat with an Oyster farmer on the way back – that looks hardwork. We also fitted the new wifi Antenna so we should be able to get better connections now as this one is powered – one of only a couple of things we think we messed up when specifying Askari. A up the mast and right now I am uploading using free wifi - great job! As we left Martha’s on Saturday we passed by Le Grand Bleu anchored outside – complete with her ‘Toy Yacht’ on deck – we wondered if she was there for the regatta that day…. The Toy looked as big as Askari – LGB is one of the largest superyachts in the world and was owned by Roman Abramovich until he gave it to a friend!